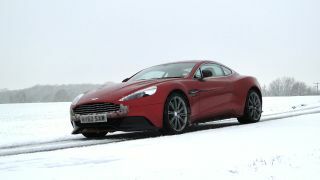 Is Aston Martin's new Vanquish supercar too beastly even for Bond? Consider the positively pornographic rear hips. Observe the razor-sharp front splitter. An elegant Aston in the idiom of a certain supine secret agent this, clearly, is not. Then there's the minor matter of a 6.0-litre V12 pumping 565bhp through the rear wheels. At the very least, you'd think 007 would need to be on the ball. But what's the Vanquish really like to drive? And how does its technology stack up in 2013? Can a small British brand keep up with the rapid developments in infotainment the big boys are rolling out? To find out, we spent the day with Aston's new range topper. Being Blighty in mid January, the conditions were inauspicious. But as we'll discover, this new Aston has a broader range of talents than you might expect. But first, some basics. Yes, the new Vanquish shares some visual DNA with previous Astons, such as the DB9 and the DBS. You can trace the V12 engine's roots back around 10 years, too. And, yup, there's a development of the VH architecture underneath. It's this basic platform that has spawned almost every new Aston in the past decade, including the DB9, the V8 Vantage and even the Rapide four-door coupé. But try this for size. Every one of the Vanquish's body panels is pure carbon fibre. That's a first for an Aston Martin and it gives you an idea of both the distance between the new Vanquish and existing Aston's and the level of technology on offer. That's just as well given the £189,995 entry fee. But is there anything that justifies the premium pricing? A naturally aspirated, 6.0-litre V12 certainly helps. With the market gravitating towards smaller capacity engines with turbo chargers, the survival of the Aston V12 is a cause for celebration. A larger, naturally aspirated engine is essentially the harder, more expensive way of delivering big power. But as we'll see, the benefits are obvious from the moment you fire the Vanquish up. Elsewhere, the Vanquish gets a thoroughly revamped interior with more space for occupants both front and rear compared with the its predecessor, the DBS. The cabin is also a showcase for Aston's broader tradition-meets-technology ethos. As you'd expect, the cabin is fully cloaked in leather. There's hide of the quilted variety, too. But thanks to a new high tech manufacturing process, the stitching is finer and more accurate than ever before. All in, Aston reckons there are no fewer than a million stitches in every Vanquish. Crikey. The infotainment kit has received something of an upgrade, too. The main LCD display is now high resolution with improved graphics. Navigation is up to snuff thanks to a partnership with Garmin. So there's no old school nonsense like lack of postcode support. What's more, the interface has been given a nice techy flourish courtesy of flush-fitting haptic controls for the infotainment and climate control functions. Prod a button and you get a little buzz, much like similar haptic controls on smartphones. Rounding out the core infotainment functionality is a full Bluetooth interface. What the Vanquish doesn't have, however, is internet connectivity. So there's no HD traffic data. The system relies on broadcast RDC-TMC traffic data. Likewise, there's no google search, no internet services and no apps. What the system does, it does well. But at this price, you might not be expecting to make any compromises. You'll very likely forgive all that, however, once you've experienced the Vanquish on the move. Make no mistake, the V12 is electrifying. With no turbos dulling the responses or engine note, it's just so sharp, so linear, so relentlessly energetic.